Is your garden plagued by spider mites? While these pests don’t occur everywhere, where they do, they can be very destructive. Here’s how to control them using natural and organic methods. The Spider Mite, Tetranychus Urticae, “Two-Spotted” or “Red Spider Mite” is a major pest in vegetable, tropical, and other ornamental plants. Its tiny size makes it difficult to see. They prefer to feed from the bottom side of leaves located in the tops of plants where it is warm and dry, although as they travel along the plant, feeding marks can be found along the main vein of leaves. As populations increase, plant damage spreads across the leaves. Spider mites feed on plant cells and produce characteristic small, yellowish, speckled feeding marks. The feeding marks are usually the first sign of a mite infestation and are often confused with some fertilizer deficiencies. Fine, silken webs can be detected on heavily infested leaves and flowers with these plant parts will quickly wither and turn brown. Many insecticides have little or no effect in controlling spider mites. Their small size, their ability to exist close to the veins of the plants, and the fact that they are a different species of pest than most other garden insects, all make controlling by spraying extremely difficult. Spider mites are sensitive to day length and are capable of hibernating within cracks and crevices of your garden structures. If you had spider mites last year, chances are excellent they will continue to be a problem this year, and in future years as well. Spider mite populations can explode under conditions of high temperature (above 85° F.) and low relative humidity (below 60% RH). 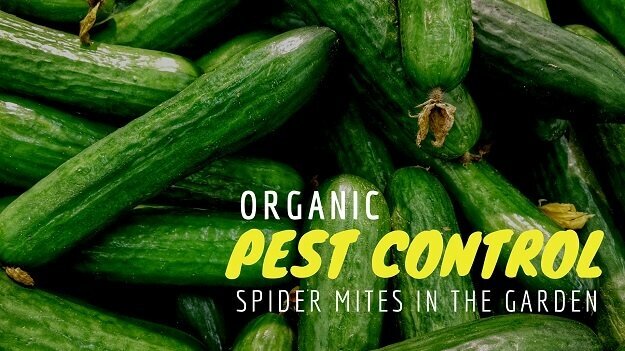 Spider mites can be difficult to get rid of just using organic pesticides, but that doesn’t mean it’s time to switch to a non-organic solution. When you use those non organic chemicals, you run the risk of damaging the soil food web that your plants thrive in. Instead, try a solution provided by Mother Nature! For example, you may want to release spider mite predators to take care of the invasion, naturally and organically. You can watch a spider mite predator release in the High Performance Garden Show in the video below. The Phytoseiulus Persimilis or the spider mite predator is a predatory mite. It is the most frequently used mite predator to control two-spotted spider mites in greenhouses and outdoor crops. Adult females are approximately 0.5 mm long, reddish in color, pear shaped and active at room temperature. About 80% are females. The best temperatures for these to develop is from 70 – 85oF. If the temperatures are favorable the development from an egg to an adult is 7 days and they live for up to a month. One spider mite predator will consume up to 20 adult spider mites. You may want to release your spider mite predators in stages every 2 weeks, which insures that you have multiple generations going at separate times. The recommended inoculation rate is 5-10 per plant. You can order the mites online from www.hydrogarden.com, or other organic gardening supply stores. Would you like more organic garden pest control tips? Check out the free High Performance Garden Show! This unique growing experience allows you to garden alongside an experienced gardener for a whole season, and learn tips and tricks for a more productive, problem-free garden.